The REIT manager has the authority to appoint Property Managers for each property managed by the REIT, whose role is to manage the day to day operations and maintenance of the property. Usually the property manager are often a subsidiary of the sponsor. Fees are charged by the trust manager as well as the property manager. Together with finance costs, utilities costs and property taxes, these charges account for a major part of a Reit’s operating expenses. Source: REITS to RICHES, written by Tam Ging Wien. Get the eBook here. So what are the key differences between a REIT and a Business Trust? A REIT can only own and operate income-generating real estate assets. 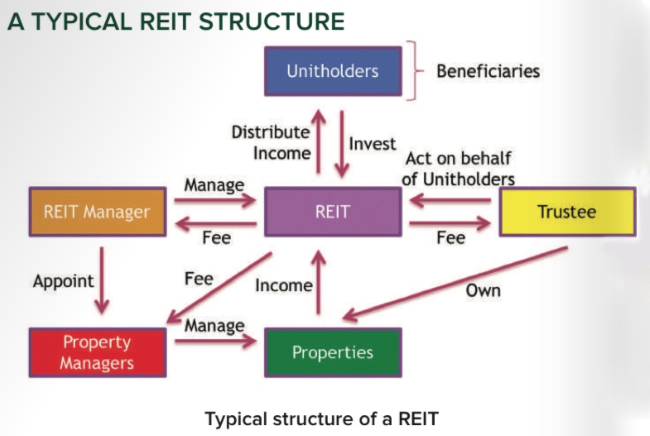 A REIT requires a trustee to hold the assets and a separate manager to manage the assets for unit holders. In Singapore, REITs must pay out at least 90% of their taxable income to unitholders each year. They are also limited to a maximum gearing ratio of 45%. The restrictions can hinder a REIT’s business, but they do come with some benefits. For instance, REITs enjoy favourable tax treatments compared to other types of companies. Business Trust is different from REITs in one basic way. While the latter has to be involved in real estate a Business Trust has no such restriction. It can operate in any field. 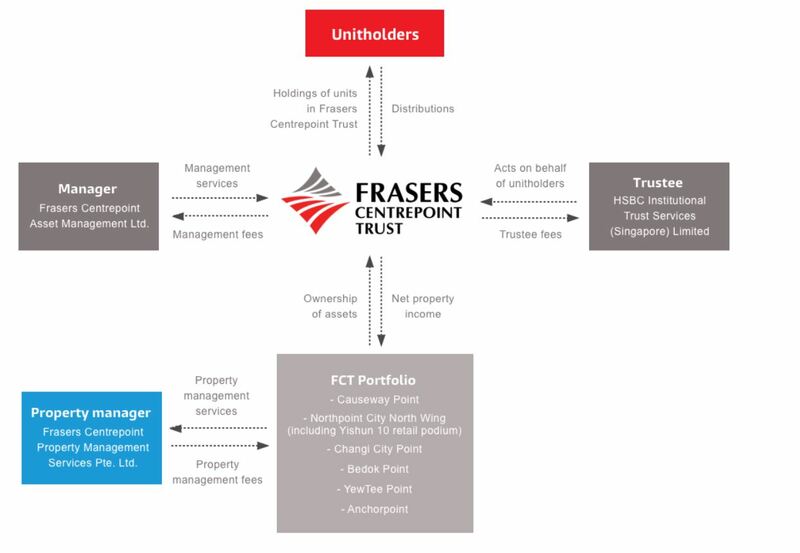 The trustee of a business trust is considered the trustee-manager and so it’s the same entity which owns and manages the assets on behalf of the unit holders of the business trust. Retail – Retail REITs invest in shopping malls and freestanding retail. Residential – Residential trust pretty straight forward, which are your housing estates such as houses, condominiums/apartments, serviced residences or residential estates. Residential trust are considered cyclical in nature and have similar characteristics and are influenced by cyclical in nature and have similar characteristic to hospitality trust. There are currently no residential REITs or stapled securities listed in Singapore. Other Specialized Trust – They are specialized in the specific industry. Example like Hutchison Port Holdings where their interest is in deep-water container port assets,located in two of the world’s busiest container port cities – Hong Kong and China. These volumes tend to be higher during economic upcycles and lower during downturns. Similar to container ports, shipping business are also cyclic in nature as the demand of ship leases are dependent on the economic cycles. 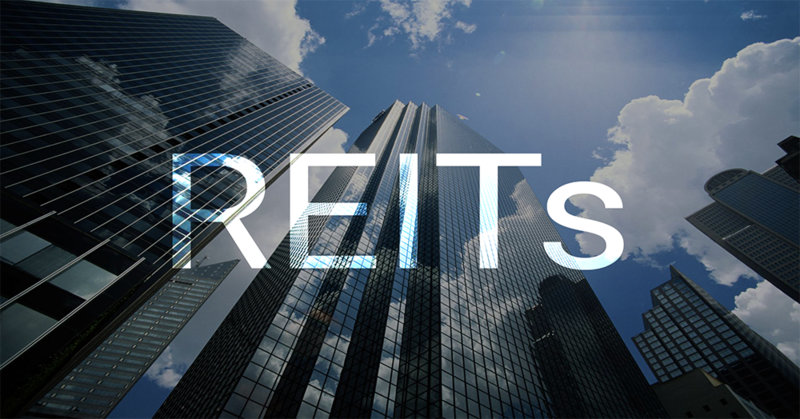 Like all companies whose stocks are publicly traded, REIT shares are priced by the market throughout the trading day. To assess the investment value of REIT shares, analysts typically consider:How is the value of REIT shares typically assessed? Real Estate Investment Trusts (REITs) are often described as instruments that offer investors the opportunity to invest in a professionally managed portfolio of real estate, through the purchase of a publicly-traded investment product. The investment objective of REITs is to provide unit holders with dividend income, usually from rental income of the REIT’s properties, and capital gains from the profitable sale of real estate assets. This might sounds appealing, but do not assume that all REITs are low risks and that dividend income are incurring. Read on the prospectus and research reports to understand the investment objective and strategy of the REIT (use reference from above pointers). Physical properties locks in your purchases when you sign on the dotted line. Carrying out a research on these physical properties can be difficult, given that getting information about their financial or property holdings can be a challenge. Another major drawback is the fact that they are illiquid. The ability to buy and sell them is significantly affected. Physical properties are not suitable for short term investors. A huge advantage of investing in physical properties is that you can get a lot of leverage up to 80% for a large absolute sum of money at an incredibly low interest rate of 1.7% range. It has to adhere to the Total Debt Servicing Ratio (TDSR) and Loan-To-Value (LTV) limits. Publicly Traded REITs, on the other hand, are real estate investment trusts that are publicly traded and are regulated by authorities. Such securities are obliged to choose right management teams and the quality of their properties is usually based on up to date trends. The CapRate is the rate of investment return from a property asset. It is used to measure how quickly a particular property was fully acquired with cash. For example, if a property has a CapRate of 4%, it means that the cost of the property will be completely recovered in 25 years time. The NPI Yield is the ratio of the NPI against the revenue of the trust. It is similar to the operating margins of a business. Therefore, a comparison of the NPI Yield of various REITs in the same class will provide a quantified measure of the efficiency of management at managing the revenue and expenses of the property portfolio. It can also be used to compare the efficiency of the management between financial periods. REITs dividend payouts can occur every six months, or quarterly. Payouts are calculated via Distribution per Unit (DPU) and yield. DPUs measure how much an investor gets for every share he has in the REIT. If the DPU is $0.0361 per share, for example, you would get ($0.0361 x 1,000) = $36.10 per lot of 1,000 shares. The annualized DPU refers to the total DPU for the entire financial year of the trust. The annualized DPU is simply the sum of all the DPU declared in the financial year. A distribution yield is a measurement of cash flow paid and how long will the investor take to breakeven for a unit in cash. For example, if a trust is priced at $20 per share collects 8 cents in interest payments during a month, the interest is multiplied by 12 for an annualized total of 96 cents. Dividing 96 cents by $20 gives a distribution yield of 4.8%. NAV is the total assets minus the total liabilities of the trust. The NAV per unit is the remaining assets of the REIT in which the unit holders will receive per unit in the event that the REIT is liquidated, and after its assets were sold off and used to pay off existing debts to debtors and bond holders. The earnings report will usually list the assets and liabilities for the same quarter of the previous year alongside figures of the latest quarter. One of the key metrics include REIT’s funds from operations (FFO) and adjusted funds from operations (AFFO). FFO strips off cost-accounting methods such as depreciation of investment properties that may inaccurately distort a REIT’s cash-generating ability. The FFO is the same as operating cash flow of a company, while the AFFO is like a company’s free cash flow. The gearing ratio refers to ratio of a company’s level of debt compared to its total assets. It can also be calculated manually by dividing the REIT’s total borrowings from the total value of its assets. A real life example, First Real Estate Investment Trust, a healthcare REIT listed in Singapore. As at 31 December 2017, First REIT had total assets valued at S$1.42 billion and had total debt of S$478.6 million. By dividing the total debt by the total assets, the gearing ratio stands at 33.6%. There is a regulatory gearing ceiling of 45%. As such, from the above, we can see that First REITs gearing ratio is well within the regulatory limit and it has the debt headroom for growth. These financial metrics are usually widely available in presentation slides for investors. Therefore, many of the financial metrics described above can be obtained directly from these slides. It is still useful for investors to understand the foundational knowledge of how these metrics works and how it is derived. Some of the sources are cited from REITS TO RICHES by Tam Ging Wien. If REITs seem too risky for you, you can look into bonds and fixed income.